Could Dropbox Become the Mobile Web's File Management System? With all the computers and smart devices in our lives, we stay connected and productive, regardless of location. But what if the file you need is on your work computer, and you're in some airport with a netbook? Enter Dropbox (various pricing, starting at free for 2GB storage), which keeps your files accessible and synced from all your various devices. Using Dropbox is simple. Once you're signed up, the only decision to make is about how much online storage you want. A free account provides 2GB, while you pay $10/month for 50GB (Dropbox Pro 50) or $20/month for 100GB (Dropbox Pro 100).The first time you open the Dropbox tray icon, you click the command to initialize the folder to your specific account. After installation on your various devices--which can include desktop PCs, notebooks, netbooks, iPads, and various smartphones--everything works automatically. The My Dropbox folder is local on each device, so you use it as you would any other folder. Even when you're not online, you can drag and drop files to it, create subfolders, save or open files, etc. But as soon as you connect to the Web, that folder automatically syncs with all other local My Dropbox folders linked to your Dropbox account. Or, you can access your private, password-protected folder on dropbox.com from any Internet-connected device. We have created Dropbox folders on every testbed in DigitalBenchmarks Lab, and on our personal systems, laptops, netbook, and iPad. (Dropbox has apps for iPad, iPhone, and Android.) We started work on this review on one of our testbeds, and saved it to the local Dropbox. Then we closed out the file on that testbed, moved over another computer, and found the review waiting for us in the local folder, having synced to the last saved version in the time it took to walk to other desk. Dropbox retains all previous versions of saved files for up to 30 days. Whenever we close out the file and save this review to a local Dropbox folder on one computer (and after we've closed out the file), a message pops up on every other system where we have installed Dropbox, informing us that a file (named "Dropbox review") has been saved to My Dropbox. Similarly, when we added a new folder to the local Dropbox on our netbook, a message popped up on all our other devices, informing us of the change. True to its name, Dropbox also works as a secure conduit for sharing files, photos and videos. When you share a folder, the recipient is prompted to open a Dropbox account (if they don't already have one), and the shared folder is saved to their Dropbox folder. Therefore, sharing folders is appropriate for collaborative endeavors. (Only that shared folder is viewable by the recipients; they can't see your other data unless you give them your password.) 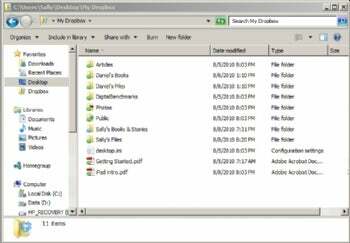 If you share a "public" link to a file or photo gallery, the recipient can open the file and save it to their own computer, but not back into your Dropbox folder. The recipient may view shared photos as a slideshow. A Dropbox spokesperson assured us, "All files stored on Dropbox servers are encrypted (AES-256) and are inaccessible without your account password. Public files are only viewable by people who have a link to the file(s). Public folders are not browsable or searchable." Dropbox is one of the few programs that we've reviewed recently that we'll keep on all our systems and use on a regular basis. We've been impressed with how seamlessly, transparently, and quickly it works, enabling us to be more efficient and more secure.